A scene from the ancient past by an artist born in Motegi-machi, Tochigi. Born in Motegi-machi, Tochigi, Haneishi Koji studied history painting under Kobori Tomoto from early on. The main subjects in nihonga (Japanese-style painting) were conventionally flowers and birds or landscapes. History painting was a genre that emerged in modern times. The Japanese term “rekishiga” began to be used as a translation for “historical picture” in the Meiji 10s (1877-1886). Japan as a modern state began to make its own history visible by means of paintings. 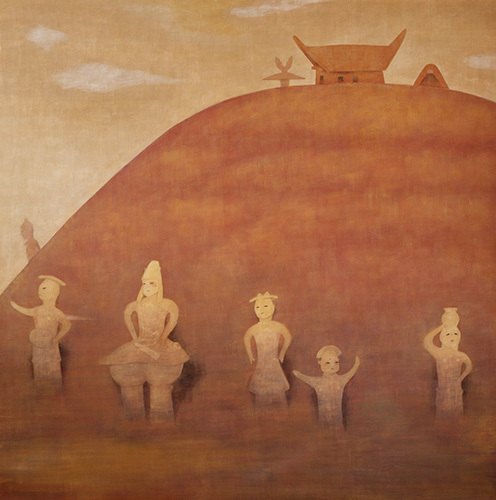 Haneishi chose ancient burial mounds as the subject of his work on several occasions. As an artist who had devoted himself to history painting, he may have been pursuing the starting point of history.